This mod allows you to create new villager professions and careers, and add or remove trades, using JSON files. The mod comes with several new trades and a few new villagers to help get you started. Create entirely new villager professions, or add new careers for existing professions, or your custom ones. Create new Trades and remove existing ones! The mod makes it easy to add your own trades, or remove trades you don't like, with more flexibility for different trade options than vanilla Minecraft includes. The mod supports trading items with metadata and NBT data, items with random potion or enchantment effects, multiple choice trades and trades with a percentage chance of occuring. If you don't like the trades or villagers I've included, you don't need to use them. You can easily disable the built-in changes using a config file. There's documentation on how the JSON files work and what options the mod supports available on the wiki. Do you plan to support this mod any further? Your wiki only shows examples of villagers trading for items with random enchantments. 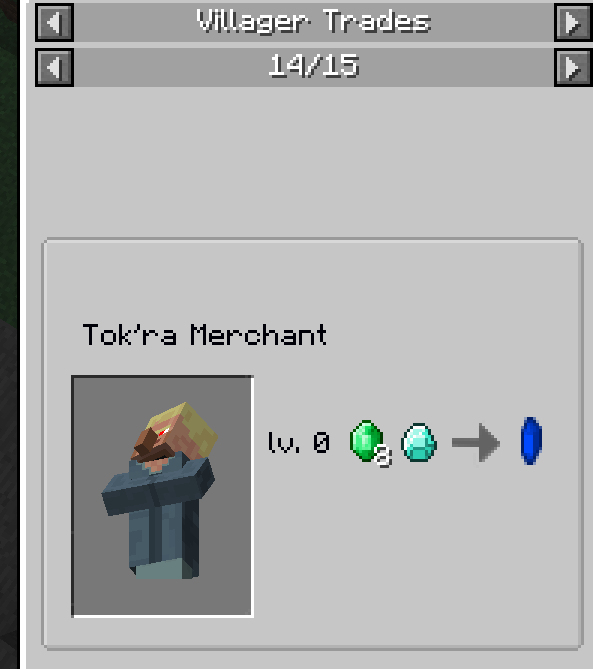 I am struggling to figure out how to get villagers to trade specific Enchant Books. Enchant books obviously use the storedenchantment nbt tag data and it does not seem to be working. I'm struggling with the same thing. If you figure out a solution, please let me know. If I figure it out, I'll do the same. Hey is this mod dead? I kinda have a bad feeling.... clicking the link to the Minecraft Forum gets you an error page - as if the thread isn't there anymore. I tried doing a search on the mod author and it says that "csb987" is an unknown user. It could be just a problem with the Minecraft forums. No idea. If you have any questions, still try and post them here. I'll try to help if I can, as I'm sure others will, too. How do I get the custom villagers to generate in villages? I believe that if the custom villager is in one of the vanilla professions, there's a chance they'll spawn normally when the village generates. 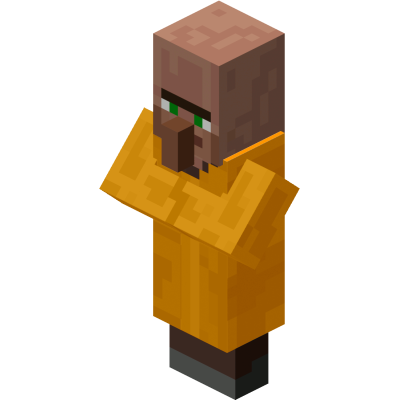 If it is in a custom profession, you'll have to make a villager breeder to get them to spawn without directly cheating them into the game. I've tried to remove the leather leggings from the leather worker trader. I have no idea why it won't work. Any help? This is what i have, I've not had to remove trades yet so im a bit confussled. Generally, I just clear all the trades and come up with new ones from scratch so I don't have to try and guess exactly how the vanilla trades are set up. I believe that unless you enter it exactly, it won't accept it. Will using quotes around keys work? 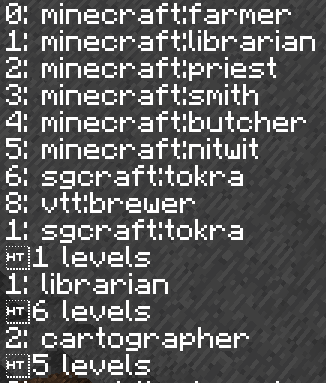 Eg "Profession" : "minecraft:butcher" instead of Profession : "Minecraft:butcher"
Why is this a problem? Is it because your editor is giving you squiggly lines, telling you something is janky or are you having other issues? Do the trades you included for Vanilla Villagers add new trades or do they replace the old ones? The ones included with the mod are in addition to the vanilla trades. Please, can you update it to 1.7.10? Is there even a way to get rid of only mending? Is the selection of CareerLevels 1, 3 and 4 correct? Did you manage to figure this out? I'm really struggling here trying to figure out how to remove mending from the game. Removing it from the enchantment pool would be ideal, but I cannot for the life of me find any documentation, crafttweaker scripts, mods, anything that will allow me to do this. I stuck with what I posted. I believe it gets rid of a bit too much, but it does get rid of mending too. Haven't found out anything to make it more precise. I had tested about 200-300 villagers and none had mending. Mending is rare though, so I'm not sure if was just unlucky. to summon villagers and all enchanted books were intact, including mending.